Lorraine Suzuki, Ph.D. ’73, passed away on September 16, 2016. Lorraine Suzuki’s extensive and eminent career stretched beyond the boundaries of her immediate community and would ultimately nurture better international relations and systems. As a young woman, she was interested in working in developing countries and sought more formal knowledge of community organization. In return for agreeing to work for the Girl Scouts of America for two years after graduation, the organization sponsored her master’s degree from the Wayne State School of Social Work. Serving as an organizer on the West Side of Chicago, she was one of the first to introduce scouting to the inner city. After fulfilling her agreement with the Girl Scouts, Lorraine worked as an organizer and a systems intervener for the Hull House/Maxwell Street area and the Lawndale neighborhood in Chicago. She also helped develop one of the first associate degrees in Social Work at Kennedy-King College, one of the City Colleges of Chicago. Her work with a school intervention program at the Woodlawn Community Mental Health Center, and as Social Service Head Start administrator with the Chicago Commission on Urban Opportunity led her to the University of Chicago School of Social Service Administration (SSA). Her responsibilities with the city involved systems organization, research, administration, and a “baptism” in political practices that convinced her she needed further education. She matriculated into SSA’s Doctoral Program and soon after, she was tutored in statistics by Yuji Suzuki, S.M. ’70, a Japanese alumnus from the graduate program in statistics and a teaching assistant in mathematics. She had not only acquired a deeper understanding of mathematics and a mastery of chopsticks, but also a life partner. They married at the University of Chicago’s Bond Chapel. Mr. Suzuki’s career would lead him to a corporate position as a managing director charged with establishing a joint corporate venture between the U.S. and Japan, and, eventually, to become owner and president of the company. Their professional lives have crisscrossed continents, with home bases in Ann Arbor, Michigan and Tokyo, Japan. After completing her Ph.D. at SSA, Mrs. Suzuki took a faculty position as an associate professor in the University of Michigan School of Social Work, teaching in the areas of policy and administration. While at Michigan, she earned a master’s degree in management from Stanford University, which provided her with new, more quantitative corporate knowledge to blend with her SSA perspective. Leaving the University of Michigan to join her husband, Mrs. Suzuki took a position in 1979 with the Asian Division of the University of Maryland University College to teach in its newly formed graduate program. She was their Director of the Business and Management and Economics Program from 1983-2001 and also the Director of International Research from 1990-2001. In her roles, she devised more efficient systems for information processing and to document interrelated service systems for the University’s overseas military programs, as well as for Asian communities. She had once said that “SSA’s focus on the individual helped her to bring the human aspect to bear on business practices and resources.” Her work was so successful that she was named the Associate Dean of the Asian Division of Programs in 2001, and eventually Vice President and Interim Director of the Asian Division. Ms. Suzuki grew the regional research program into one of the enterprise’s largest and most successful international programs. She retired in 2008. 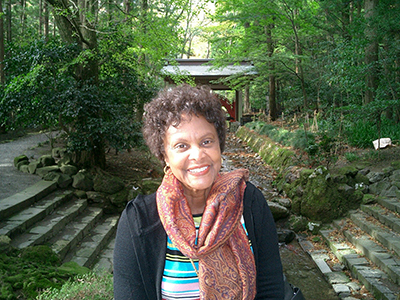 In 1992, Lorraine and Yuji Suzuki appeared in the documentary film, Struggle and Success: The African American Experience in Japan broadcast on PBS in America and NHK in Japan in which Lorraine Suzuki described her experiences as an African American woman living and working in Japan in the context of prevailing misconceptions of Blacks in Japanese culture. Mrs. Suzuki was a member of SSA’s Visiting Committee from 2011-14. She also served on SSA’s Centennial Committee in 2008-09 and on the Steering Committee in 2010-11 to establish an endowed fellowship in Early Child Development in honor of Dodie Norton, the Samuel Deutsch Professor Emerita. In honor of her husband Yuji, Mrs. Suzuki created the Yuji Suzuki Scholarship in 2011. The first award was granted to SSA graduate Patrise Washington, AM ’16. Mrs. Suzuki is survived by her husband Yuji Suzuki, S.M. ’70 (Statistics) and their son Keelan. A memorial service will not be held. Lorraine did not want to have a funeral or any sad gathering, but instead she wanted to have a cheerful celebration of life. On June 18, 2016, Yuji and Keelan brought together friends and family to Novi, Michigan where they shared stories about Lorraine, and it was evident how many lives were touched and changed because of Lorraine’s friendship and selfless service to everyone who crossed her path.